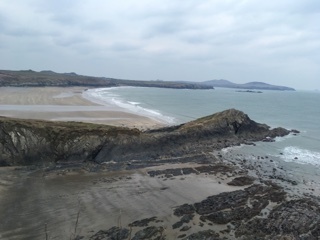 The St Davids Day weekend celebration on the most westerly tip of Wales was shaping up to be an interesting one! Britain’s smallest city was gearing up for the annual celebration of the principalities patron saint, with a children’s dragon parade, civic functions, cawl competitions, packed pubs, live music and so on. 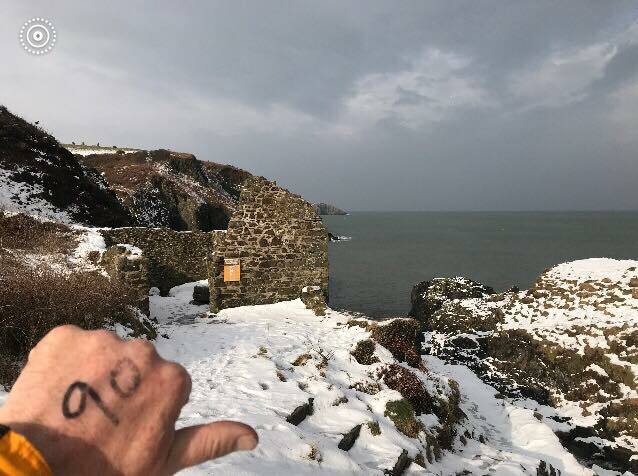 We had 305 runners and their entourage heading our way from the four corners of the UK, plus The Beast from the East making its way uninvited from the Arctic. 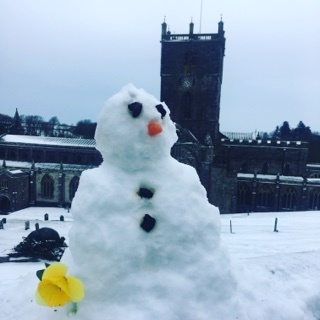 Whilst not to be left out Storm Emma started making its way North from Portugal. What could go wrong!!! It was in the previous week we heard the UK Weather experts refer to this phenomenal as the Beast from the East, whilst the French counterparts were calling it “Bete de l’est” and in Finland it was known as Wednesday!!! Having done 40 plus events over an 8 year period in this part of the world the weather is always a topic of discussion, but I can only think of 3 occasions where we have talked about cancelling an event. However this has never materialised. 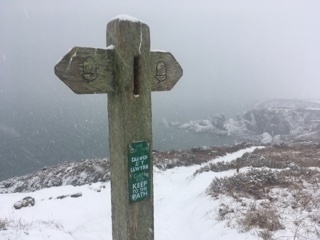 The climate down in St Davids is quite often void of extremes, (in terms of Temperatures) snow is rare and it’s not uncommon for any front to totally miss us. All we could do was plan and prepare for the event, with one eye on the forecast. Seconding guessing it’s severity and actual ETA. Things kept changing slightly but sometimes slightly is all you need especially on this western peninsular. Then Big Wednesday came and we knew things were going to be interesting. It was like a COBRA meeting within central government. What do we do!? We have contingencies but then so does every organisation, and like them will these cope with the severity of what the Beast brings! The Beast had hit certain parts of the Country, with reports that it will get worse. We started receiving lots of calls, messages and emails asking is it still on? 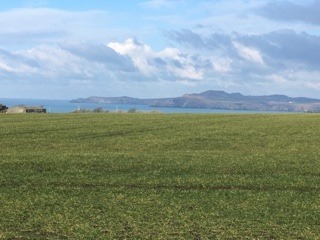 With most of Wednesday spent on the course and in the knowledge that Pembrokeshire was open for business all we could say was “It’s on, but that may change” perhaps not the best answer but the only realistic one. We also felt that runners would be protected from the Easterly wind for the majority of the course. So yes it would be tough but doable. Our main concern was the temperatures and the time on the course and potential time for this to increase if injury was to occur. Therefore we started making “extra arrangements” to combat this. Extra resources were brought in to combat and support the runners. Obviously people want to know what is happening and learning from experience it is so important to open up a good line of communication with the runners. For this we moved away from Social Media (believe it or not, not everyone is on it!) plus SM attracts comments, questions and opinions from people who aren’t registered or in the know! And the most important people to get the message to are those actually taking part. We went to the email list of those entered, to explain what is happening and what we are predicting. Don’t get me wrong this was not foolproof! Emails going to spam folders, persons registered by someone else and not getting the messages. But I think these were all sorted fairly quickly. Our major consideration at was point was the knowledge that a lot of people were travelling a great distance, had work, childcare, pets and other life issues to sort out as well as the thought of “are we talking on one of the toughest marathons in the UK in one of the harshest conditions to hit the UK!” And that we the organisers needed to keep this communication process as good and concise as possible. To try and help runners in the difficult decision making process and take away any unnecessary stress/pressure. 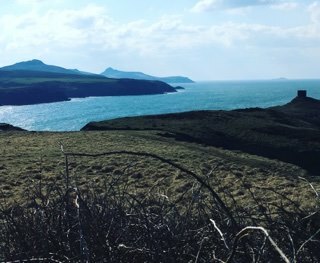 A decision was made to allow anyone struggling to make it to St Davids due to travelling problems to defer their entry to next year. Now it’s human nature that everyone has an opinion on how things should be done! And I’m not being funny when I say some of these opinions are born out of one-eyed view on how it will effect them or their view on one cog of a many part machine and are more than often from those not actually taking part in the event! However you’d be an extremely silly person if you were not to listen to the competitors concerns, ideas and advice. and these are always considered even if we can’t practically action them. Personally we have 3 or 4 persons who between them have run over 300 marathons or ultras on five continents and have been involved in organising a fair few events too. As well as 15 RDS under their belts! So even though I may come across argumentative or dismissive to them!! you’d be a fool not to take on board this experience. And that goes for post event analysis to. More than not we do actually agree, but it’s always nice to have things reaffirmed on this occasion it was all about the event safety and we were definitely all on the same page. 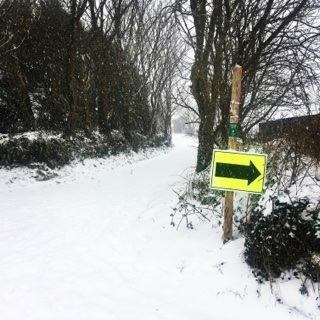 In its basic form the major concern was the Cold especially on the Marathon – If not for all definitely for the majority and this would hit on the 15 plus mile mark, it was then for us to workout how to combat this and plans were put into place. The Emails and phone were red hot! As the Beast started to cause havoc in the Home Counties and with our Friends up North. 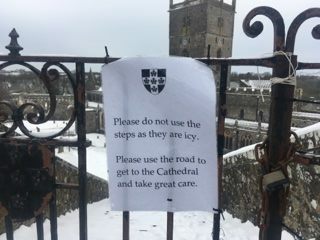 Whilst we spent the majority of the day on the Path putting signs out and checking certain bits. I’ve got to say it was perfect conditions for running, Yes it would have been cold in shorts and vest or if you suddenly slowed down but no reason not to run the event. Then at about 3pm I came off the path and first of all had a call from Sky News asking to come down and cover the event, Which I thought that’s nice! But also that’s a bit worrying! Then I drove to H/West and went to Aldi (other supermarkets are just as good but not as cheap) to pick up the last lot of water and aid station bits n bobs. Dressed in my fatigues bearing a resemblance to a survillist and with trolley full of what looked like some serious panic buying – I had some funny looks, which is saying something for Hwest Aldi!! But the town definitely had that Christmas Eve feel of shops shutting early and a mass exodus, with everyone being up beat with the prospect of a day off work. 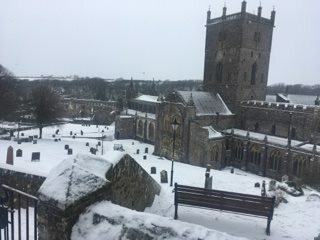 Approximately 1800hrs on Thursday a fairly decent snowfall was descending on St Davids. At this point I was out in the landrover, picking up some extra Safety kit from Pencwm when my windscreen froze! Which I thought was unusual! A bit like “The day after tomorrow” eye of the storm stuff. But more worrying I had a text from the Marathon first aid team in Swansea saying “we are unlikely to be able to make it” Plus a lot of people from outside of the county had taken us up on the offer to defer their entry. 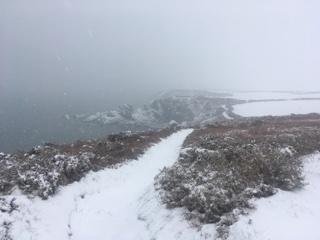 At this point I returned to St Davids and with our other directors and key persons a decision was made in the best interest of the majority of the marathon runners to cancel Saturdays event. With an note that the Half was still on with a caveat that a decision would be made at 11am Friday morning. A large amount of the Marathon runners were coming from across the UK and were struggling to get to us. The timeout on the course would be considerable for some of the runners (6 to 7hrs) and likewise for Marshalls. In what was forecasting to be extreme temperatures, which carries a safety risk even if all goes well. A positive factor was yes trail runners are a hard bunch of people and the majority can look after themselves. But it’s impossible to vet this quality. And with some of the very most experienced runners saying “it wasn’t wise” it probably wasn’t. But people had not paid £2000 to sign up for the North Pole Marathon! The majority would not of been prepared for the distance and the cold and due to conditions we could not have guaranteed the level of support needed for such an ordeal. We relayed this information to the runners and again offered deferral or drop down to the half. In regards to the half we stated a decision would be made on this at 11am Friday. The majority of half runners were travelling from within Pembrokeshire and could possibly make it at shorter notice. 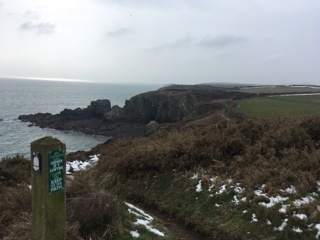 We had the support to add extra resources into the half course to give the runners extra support they needed to complete the course particularly the 8mile coast path section. Yes there was concerns raised to us that some of the half runners might be less experienced but this could not be said for all and at this point we knew what had to be done to make sure they had plenty of checkpoints. The Beast had well and truly hit and it was like waking up in a Dickens Christmas Carol, White everywhere, no vehicles on the roads and kids out on sledges. I spoke to a few people to get a snapshot of the county. To be honest once we had heard that Hospital Staff were being taken into work by 4×4’s the night staff were stuck in work and the other emergency services were in the same boat. We thought that’s it it’s a no go, we couldn’t potentially put extra strain on the system. This along with the facts that we could not guarantee (wouldn’t be able to) a quick or any sort of response to all aspects of the course. The snow had literally isolated the rural areas and our escape/access routes were impassable. So no other factors mattered really, it was a no. Saying that, yes the snow may not have lasted and Saturday morning could be a different scenario! 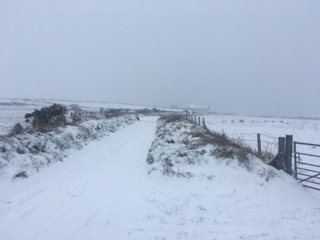 But the high probability was that at 6 or 7am when persons would be driving to us the roads would be potentially dangerous with icy & snow and the rural sections of the course would still be isolated. 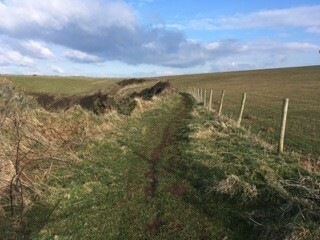 And on a lighter side, If we had of done it the home straight or should we say “home hill” was like a downhill ski slope. If you could have managed to get up it without falling over the local kids on sledges would have been playing tenpin bowling with you! Well one thing was right – To call it off! 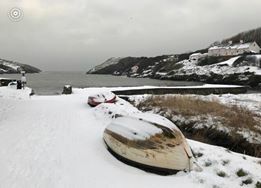 The morning was a no go for travelling on the rural roads, however it did not take long for the snow to disappear around the St Davids Peninsula and traffic started to move relatively easily on the main roads. 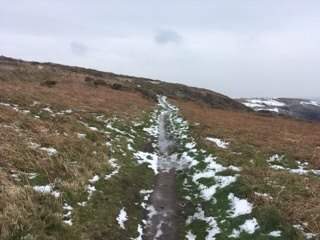 However I was later to speak with 3 guys who had run sections of the path in the morning, It would appear that this great melt was very isolated. One of the runners trying to get the marathon distance in cut his effort short!! 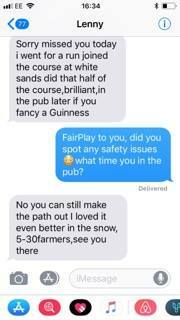 as it took him 5hrs to do 20 miles or so and said he was slipping, falling, and crawling over 10ft snow drifts on the path and the cold was taking it’s effect. And this was on a well equipped (also using poles) ultra runner/Military man – He said “Calling it off was the right thing” just in case we were ever in doubt. I don’t think anyone is arguing with that. The frustrating thing is Last weekend was perfect! Thursday was perfect and Sunday was fine! But then we can’t dwell on that too long because it has worked the other way a good few times. When we have said “good job it wasn’t yesterday” or similar. With a couple of rooms full of event kit, from Medals, T-shirts, Food, Safety kit, numbers, water and so on. Action needs to be taken! The next step is to decide, do we run it again or just defer it to next year! What we are trying to do is find a date in an already congested calendar to run it ASAP. We will then give the entrants the option to defer to the new date or to next years event. The hardest thing is to find a date, we don’t want to clash with another event and potentially split a field – but its a tough one. We appreciate that for some they will have to book time off work, make travelling arrangements and already have a busy events calendar and next year might be the only option. We also appreciate that some have trained specifically for this and are raring to go! And would welcome an alternative date. And we are also aware that an alternative date will not suit all. Basically whatever we do will not suit everyone. Which is gutting but what can you do! We are waiting for a few key personal to get back to us about alternative dates and we hope all competitors will be emailed monday with an update, thank you for your understanding and support. 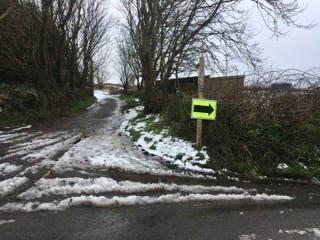 A massive thanks to the Marshals who were willing to brave the elements, the runners for your understanding, patience and kind words. And to the Cross Hotel for preparing for us and for being keen to go again next time! Until then its the TOUR DE SHANE – 24th March if you fancy a little ride!